Aleesoft Android Converter is an android video converter, This video to android converter can help you convert video to android phone including Nexus One, G1, MILESTONE, X10 / X10i, HTC Dream, HTC Fuze, HTC Magic, HTC Touch, CLIQ, etc. then let you enjoy video and music on your Android mobile phone. Android is a mobile operating system initially developed by Android Inc., a firm purchased by Google in 2005. Android is based upon a modified version of the Linux kernel. Google and other members of the Open Handset Alliance collaborated to develop and release Android to the world. The Android Open Source Project (AOSP) is tasked with the maintenance and further development of Android. Before converting video to Android smartphone, please download and install Aleesoft Android Converter. Step 2: Add video. Click "New Task" button to add video to this Android video converter, also you can drag and drop video file from windows explorer into this video to Android Converter. Step 3: Convert. 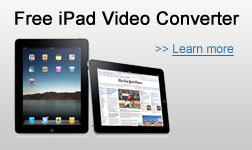 Click "Convert" button to begin converting video to Android mobile phone. After android conversion completed, you can transfer the converted video file to your Android smartphone and enjoy.